Given its unprecedented popularity, it may be difficult for many visitors to Wellcome Collection’s exhibition Death: A Self-Portrait to imagine – if you will – life after Death. However, as the exhibition’s run has now ended, it may be worth considering just how ‘life after death’ has been conceived – not through a discussion of spiritualism but from another concern of the nineteenth century, premature burial (‘our most primal fear’, to quote from the sub-title to Jan Bondeson’s history of the topic Buried Alive (2001)). Aside from Bondeson’s history – which argues that fear of premature burial in the West was mostly constituted in the 18th and 19th centuries – there are are a range of other items in our holdings from which to explore this topic in more detail. We’ve reached for one book from the Library’s collections in particular: Premature burial and how it may be prevented : with special reference to trance, catalepsy, and other forms of suspended animation. The Library’s copy is the second edition of this work and was published in 1905. The authors of the book – William Tebb and Col Edward Perry Vollum – were actively involved in a range of social movements in the 19th century (including the abolition of slavery, anti-vaccination, spiritualism, and theosophy). Tebb co-founded the London Association for the Prevention of Premature Burial in 1896, which campaigned for reforms to make sure that persons pronounced deceased actually were before their bodies were consigned to the ground. The second edition of Premature burial… contains 450 pages of argument for their cause but only a few illustrations. Two of these, however, are of an invention that aimed to secure the release of an individual if he or she had been wrongly buried. 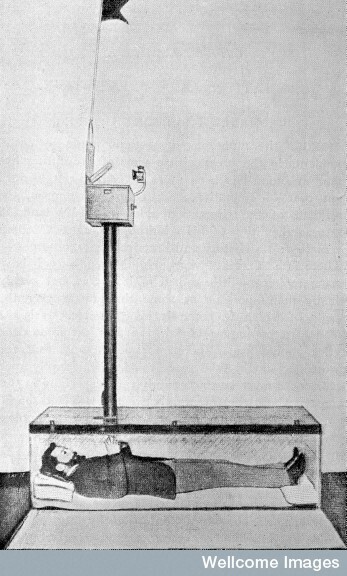 Whilst there had been earlier so-called ‘safety coffins’ (and not just those imagined by Edgar Allan Poe), the device described in Premature Burial… was designed by Count Michel de Karnice-Karnicki, a chamberlain to Czar Nicholas of Russia who claimed to have witnessed the premature burial of a girl in Belgium. To an international audience in Paris in 1897, Karnice-Karnicki unveiled his apparatus. “…it consists of a long tube, about three and a half inches diameter, and a hermetically-sealed box. The tube is fixed into an aperture in the coffin as soon as the latter is lowered into the grave. No gases can escape from the tomb into the outer air, as the metallic box into which the upper end of the tube enters cannot be opened from the outside. On the slightest movement of the chest’s wall, as in the act of marked breathing, or movement of the body, the glass ball releases a spring which causes the lid of the iron box to fly open immediately, thus admitting both air and light to the coffin. At the same time a flag rises perpendicularly about for feet above the ground, and a bell is set ringing which continues for about half an hour. In front of the box, an electric lamp burns which gives light after sunset to the coffin below. The tube acts as a speaking tube, and the voice of the inmate of the coffin, however feeble is intensified. The working ability of the apparatus has been tested by its application to individuals who volunteered to be coffined, and who found that the mere act of breathing was sufficient to produce all the phenomena mentioned above. Karnice-Karnicki’s invention – which he titled Le Karnice – was tested not only in France but promoted by him across Europe and in the Unites States. A problem with the device was quickly apparent: the smallest movement of a corpse through decomposition set off its highly sensitive mechanism. No doubt concerned about an outbreak in cemeteries of bell ringing, flag flying and the exhumation of decaying corpses – and despite the relatively low cost as suggested by Tebb and Vollum – Le Karnice did not prove a success. But perhaps Karnice-Kanicki’s invention inspired something else. Given the Count’s name, could he possibly be an inspiration for the fictional character Thomas Carnacki? The creation of the author William Hope Hodgson, Carancki was one of the many fictional detectives who followed in the footsteps of Sherlock Holmes at the end of the 19th century. Whereas Holmes exuded rationality, Carnacki’s cases delved deep into the world of the supernatural. As Hodgson’s stories – published in 1913 as Carnacki the Ghost Finder – are built around entities from the spirit world re-entering the world of the living, there is a degree of similarity with Karnice-Kanicki’s invention.